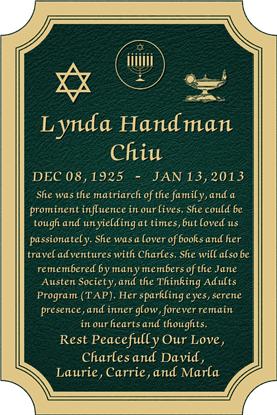 The Austin TX chapter of JASNA would like to express deepest sorrow at the death of Lynda Handman Chiu, our longtime coordinator, on January 13, 2013. Lynda inspired us with her imagination and dedication as well as with her resourceful knowledge of Jane Austen’s writings, one of which she made the focal point of every meeting. She admired Austen’s ability to reflect accurately the psychology of human feelings and traits. 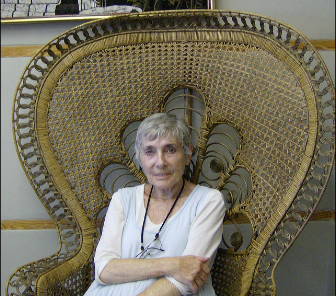 She was a constant learner and a motivating teacher. We will sorely miss her vivacity, her laugh, her sparkle, and her leadership. 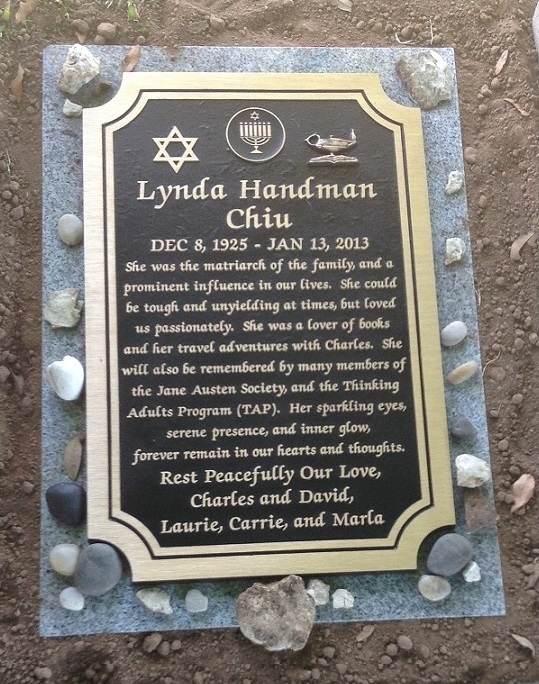 Lynda’s husband, Charles, has set up a website to her memory. You are welcome to add your tribute to a wonderful Janeite. A new gravestone was added. On this occasion several friends and family were gathered to dedicate the stone. Judith Michaels represented the South Central Texas Region of JASNA and gave the following remarks. On the Occasion of Unveiling the stone in the cemetery. d) Ending the meeting with lightly competitive group quizzes of five questions each, altogether twenty-five questions. Participants in the winning group with most quiz points compete with each other to draw the highest numbered paper from a basket for the Grand Prize, a Jane Austen-related book or an piece of memorabilia. Participants in the unfortunately, but still brilliant, low-point group compete with each other to draw the lowest numbered paper from a basket for the second Grand Prize. Along with education and entertainment, Lynda’s inspiring personal philosophy is a model for living, it being best to read and learn at every possible moment to balance personal time and social opportunity, to welcome people warmly into the fold–Lynda’s making one feel like a magician’s valuable gem with something precious inside it. For Lynda, Jane Austen’s novels link the past to the present, the generation to generation of readers, parents reading them aloud to children who reread the novels in adulthood, appreciating Jane Austen’s perennial situations in the lives of her characters. At the end of this short speech, I wonder about the shared characteristics Lynda Chiu and Jane Austen–the latter an anonymously published author at first and the former a teacher who explodes the sense, sensibility, and humor of the eighteenth-century charm. Both women reach the minds of more people than they know; both are formative influences upon people. Both are perceptive psychologists, inquisitive about what makes human beings tick in social situations, and about their society’s links to distant shores. Because of Lynda Handman Chiu’s friendship, insight, and warmth, members of the regional Jane Austen Society have a foundation upon which to celebrate more the English woman’s creative vision.